Under the Grand Chapiteau at Citi Field in New York. 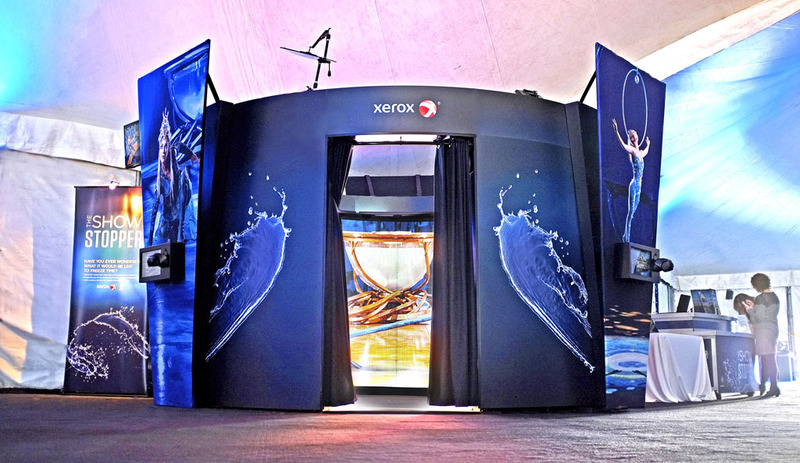 As a partner of Cirque du Soleil, Xerox worked with Big Freeze Worldwide to create the world’s only portable 360° movie booth that give fans an experience like never before. Named The Show Stopper, Big Freeze Worldwide developed a one-of-a-kind high tech PODCAM360 Movie Booth customized for Xerox’s partnership with Cirque du Soleil. This hybrid PODCAM360 system is the only traveling Frozen Movement Movie Booth that allows visitors to capture and share their own unique 360° Movie Effect all from one location. The Show Stopper’s interior 360° wall is actually a high-tech LED skin that displays an exciting image of the Amaluna stage, so each Movie Effect capture puts the visitor in the center of their own 360° performance! And that’s not all. Xerox provides visitors with high resolution color photos of themselves in action, as seen from the main front camera of The Show Stopper. Each photo is printed on a Xerox Phaser 7800X and personalized using Xerox’s XMPie technology. Upon entering The Show Stopper, visitors are greeted by a Brand Ambassador who will position them in the center of the PODCAM360 and provide direction on how to pose for a great Movie Effect. The Brand Ambassador then gives visitors a countdown and activates the Camera Array at the exact moment of Action! Once a visitor’s 360° Movie Effect is captured, they are guided through the viewing process at the built-in kiosks on the outside of The Show Stopper. Visitors select which Movie Effect they prefer and enter their email address. Minutes later, guests receive an HTML email that plays their Movie when clicked and are able to share their Movie via Email, Facebook and Twitter. Although the capture only takes a moment, the finished 360° Movie Effect can be played infinitely. Visitors are then directed towards Xerox printers onsite where they may collect the high resolution photos of their experience. The on-site PODCAM360 experience is not only fun, it also provides unique takeaways that visitors of all ages appreciate. From the high resolution photo prints to treasure or share, to the sharable 360° Movie Effect loops, anyone can go viral with PODCAM360. The Show Stopper is specifically designed to be very transportable with simple set-up and strike construction. Complete installation of the PODCAM360 System takes about 8 hours. Following New York, The Show Stopper will travel with Amaluna to Boston in late May. Come by and see us!